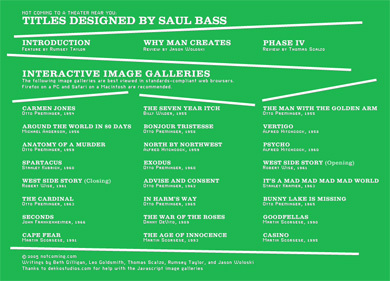 One is pressed to cite an example of an active, self-contained, and characteristic credits sequence in film prior to the work of Saul Bass. Undoubtedly, there are examples that presage Bass’ pioneering work; namely, the famous final credits of Citizen Kane reprise excerpts from the film, underscoring the footage with actors’ names. Likewise, overtures frequently preceded films of the ’30s and ’40s. Many of these are visually complimented by static credits, and in some cases a montage. And despite these examples, in regard to innovation, renown, and influence, Bass’ impact in credits design remains virtually unparalleled, even to this day.